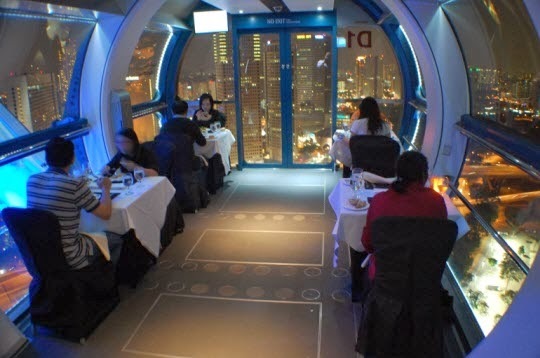 Dine in the sky above Singapore in one of 28 bus sized capsules. Editor’s note: The following is the ninth in a yearlong monthly series on the world’s mega-sized Ferris wheels. At a height of 541 feet, Singapore Flyer is one of the world’s largest Giant Observation Wheel and also one of Asia’s biggest tourist attractions. Inspired by national icons such as the Eiffel Tower and the London Eye, Singapore Flyer was conceived by Dr. Kisho Kurokawa of Japan and DP Architects, both leaders in the industry renowned for their unique architectural designs. It held its groundbreaking ceremony in September 2005 and was launched in 2008. 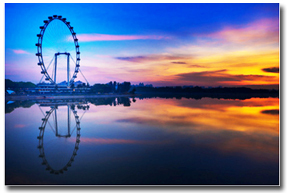 It offers a panorama that captures Marina Bay’s skyline with a glimpse of neighboring Malaysia and Indonesia.